Thanks to Jean Philippe Bempel who challenged my results (for a reason), I discovered an issue in last post: Code-completion let me accidentally choose Executors.newSingleThreadScheduledExecutor() instead of Executors.newSingleThreadExecutor(), so the pinned-to-thread-actor results are actually even better than reported previously. The big picture has not changed that much, but its still worthwhile reporting. On a second note: There are many other aspects to concurrent scheduling such as queue implementations etc.. Especially if there is no "beef" inside the message processing, these differences become more dominant compared to cache misses, but this is another problem that has been covered extensively by other people in depth (e.g. Nitsan Wakart). Focus of this experiment is locality/cache misses, keep in mind different queueing implementations of executors for sure add dirt/bias. As requested, I add results from the linux "perf" tool to prove there are significant differences in cache misses caused by random assignment of Thread - to Actor as done by ThreadPoolExecutor and WorkStealingExecutor. Check out my recent post for a description of the test case. As in previous post, "dedicated" actor-pinned-to-thread performs best. 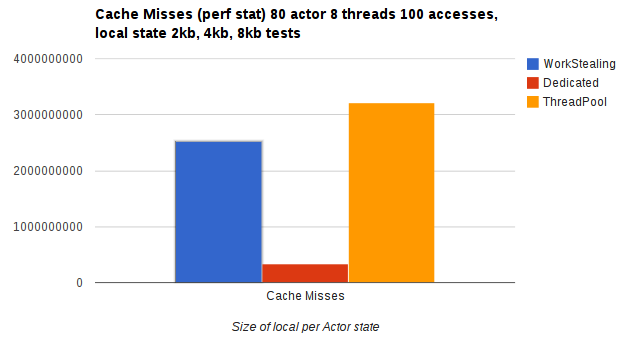 For very small local state, there are only few cache misses so differences are small, but widen once a bigger chunk of memory is accessed by each actor. Note that ThreadPool is hampered by its internal scheduling/queuing mechanics, regardless of locality, it performs weak. When increasing number of Actors to 8000 (so 1000 actors per thread), "Workstealing" and "Dedicated" perform similar. Reason: executing 8000 actors round robin creates cache misses for both executors. 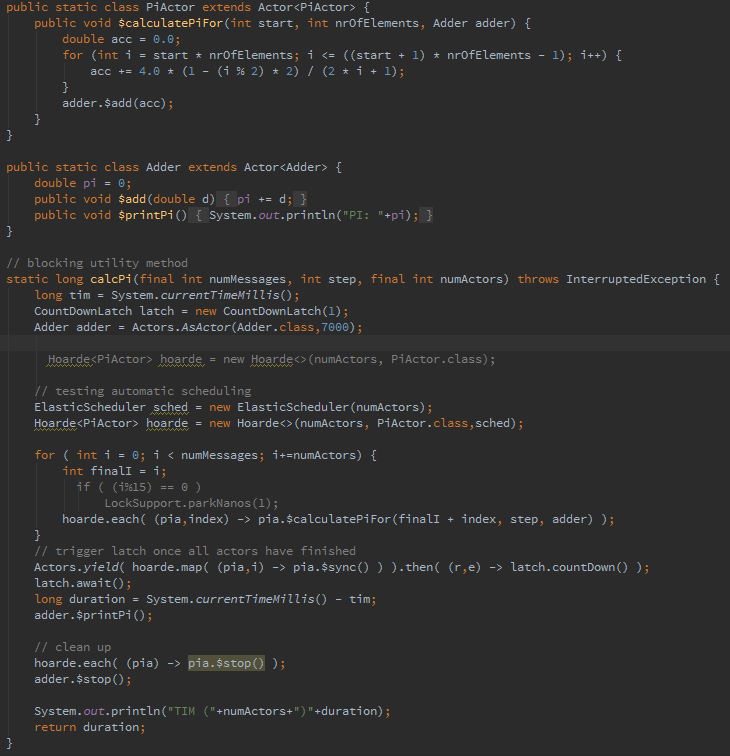 Note that in a real world server its likely that there are active and inactive actors, so I'd expect "Dedicated" to perform slightly better than in this synthetic test. In order to get a more realistic impression I replaced the synthetic int-iteration by some dirty "real world" dummy stuff (do some allocation and HashMap put/get). Instead of increasing the size of the "localstate" int array, I increase the HashMap size (should also have negative impact on locality). Conclusions basically stay same as in original post. Remember cache misses are only one factor of overall runtime performance, so there are workloads where results might look different. Quality/specialization of queue implementation will have huge impact in case processing consists of only some lines of code. Pinning actors to threads created lowest cache miss rates in any case tested. 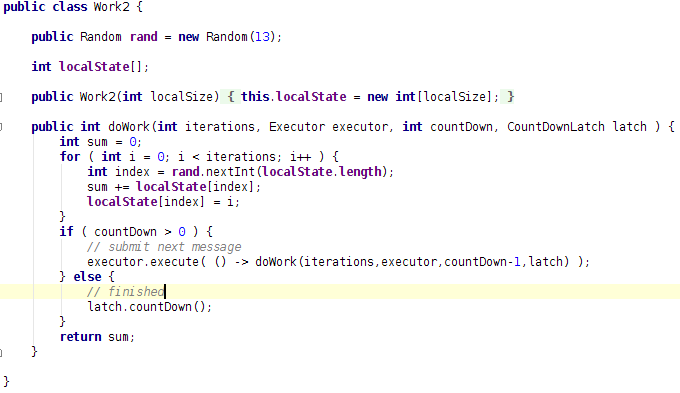 Update: I accidentally used newSingleThreadScheduledExecutor instead of newFixedThreadPool(1) for the "Dedicated" test case [ide code completion ..]. With this corrected, "Dedicated" outperforms even more. See follow up post for updated results + "perf" tool cache miss measurement results (do not really change the big picture). The experiment in my last post had a serious flaw: In an actor system, operations on a single actor are executed one after the other. However by naively adding message-processing jobs to executors, private actor state was accessed concurrently, leading to "false-sharing" and cache coherency related costs especially for small local state sizes. Therefore I modified the test. For each Actor scheduled, the next message-processing is scheduled once the previous one finished, so the experiment resembles the behaviour of typical actors (or lightweight processes/tasks/fibers) correctly without concurrent access to a memory region. 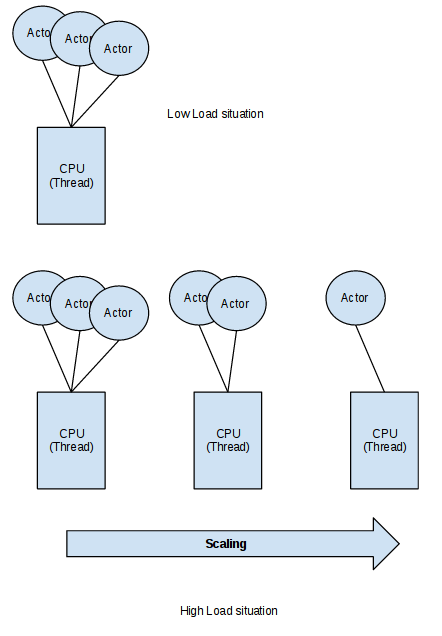 As ThreadPoolExecutor and WorkStealingExecutor schedule each message on a random Thread, they will produce more cache misses compared to pinning each actor onto a fixed thread. Speculation is, that work stealing cannot make up for the costs provoked by cache misses. For this particular load, fixed assigned threads outperform executors. 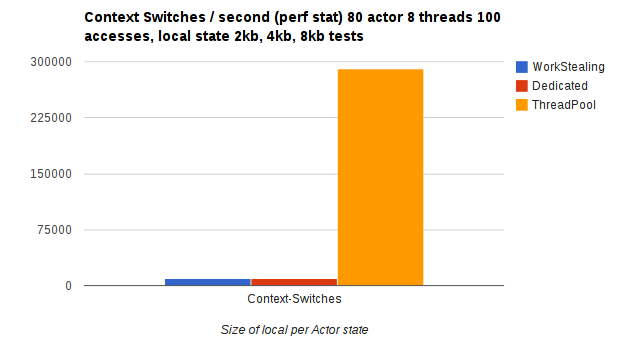 Note: the larger the local state of an actor, the higher the probability of a prefetch fail => cache miss. In this scenario my suspection holds true: Work stealing cannot make up for the amount of cache misses. fixed assigned threads profit, because its likely, some state of a previously processed message resides still in cache once a new message is processed on an actor. Its remarkable how bad ThreadpoolExecutor performs in this experiment. With this amount of actors, all execution schemes suffer from cache misses, as the accumulated size of 8000 actors is too big to fit into L1 cache. Therefore the cache advantage of fixed-assigned threads ('Dedicated') does not make up for the lack of work stealing. Work Stealing Executor outperforms any other execution scheme if a large amount of state is involved. This is a somewhat unrealistic scenario as in a real server application, client request probably do not arrive "round robin", but some clients are more active than others. So in practice I'd expect "Dedicated" will at least have some advantage of higher cache hits. Anyway: when serving many clients (stateful), WorkStealing could be expected to outperform. These results complete the picture: with fewer actors, cache effect supercede work stealing. The higher the number of actors, the higher the number of cache misses gets, so work stealing starts outperforming dedicated threads. If a message-processing does few memory accesses, work stealing improves compared to the other 2. Reason: fewer memory access means fewer cache misses means work stealing gets more significant in the overall result. Fewer worker threads (e.g. 6) increase probability of an actor message being scheduled to the "right" thread "by accident", so cache miss penalty is lower which lets work stealing perform better than "Dedicated" (the fewer threads used, the lower the cache advantage of fixed assigned "Dedicated" threads). Vice versa: if the number of cores involved increases, fixed thread assignment gets ahead. WorkStealing could be viewed as the better overall solution. Especially if a lot of L1 cache misses are to be expected anyway. Vanilla thread pools without work stealing and actor-to-thread affinity perform significantly worse and should not be used to execute lightweight processes. Executors work well when fed with short units of stateless work, e.g. : division of a computation onto many CPU's. However they are sub-optimal to schedule jobs which are part of an ongoing, larger unit of work, e.g. : Scheduling messages of an actor or lightweight process. Many Actor Frameworks (or similar message passing concurrency frameworks) schedule batches of messages using an Executor service. As the Executor service is not context aware, this spreads out processing of a single Actor/Task's messages across several threads/CPU's. This can lead to many cache misses when accessing the state of an Actor/Process/Task as the processing thread changes frequently. Even worse, this way CPU caches cannot stabilize as each new "Runnable" washes out cached memory of the previously processed task's. A second issue arises when using busy-spin polling. If a framework reads its queues using busy-spin, it generates 100% CPU load for each processing Thread. So one would like to add a second thread/core only if absolutely required, so a one-thread-per-actor policy is not feasible. With Kontraktor 2.0 I implemented a different scheduling mechanism, which achieves a horizontal scaling using a very simple metric to measure actual application CPU requirements, without randomly spreading processing of an actor onto different Cores's. An actor has a fixed assignment to a workerthread ("DispatcherThread"). The scheduler periodically reschedules Actors by moving them to another worker if necessary. 1) a Thread is observed as being overloaded, if the consume loop (pulling messages from the actor queue) has not been idle for N messages (currently N=1000). 2) If a Thread has been marked "overloaded", Actors with largest mailbox sizes are migrated to a newly started Thread (until #Threads == ThreadMax) as long SUM_QUEUED_MSG(Actors scheduled on Thread A) > SUM_QUEUED_MSG(Actors scheduled on newly created Thread B). 3) in case #Threads == ThreadMax, actors are rebalanced based on summation of queued messages and "overload" observations. If the processing time of messages vary a lot, summation of queued messages is misleading. An improvement would be to add a weight onto each message type by profiling periodically. A simpler option would be to give an Actor an additional weight to be multiplicated with its queue size. For load bursts, there is a latency until all of the available CPU's are actually used. The delay until JIT kicks in produces bad profiling data and leads to false scale ups (heals over time, so not that bad). Update: Woke up this morning and it came to my mind this experiment has a flaw, as jobs per workitem are scheduled in parallel for the executor tests, so I am probably measuring the effects of false sharing. Results below removed, check the follow up post. To measure cost of auto-scheduling vs. explicit Actor=>Thread assignment, I run the Computing-Pi Test (see previous posts). These numbers do not show effects of locality as it compares explicit scheduling with automatic scheduling. Test 2 always starts with one worker and needs to scale up automatically once it detects actual load. The test is run 8 times with increasing thread_max by one with each run. Differences in runtimes can be attributed mostly to the delay in scaling up. For deterministic load problems, prearranged Actor scheduling is more efficient ofc. However thinking of a server receiving varying request loads over time, automatic scaling is a valid option.